BRADFORD’S new BID is helping to bring a splash of festival colour to one of the city’s oldest streets. 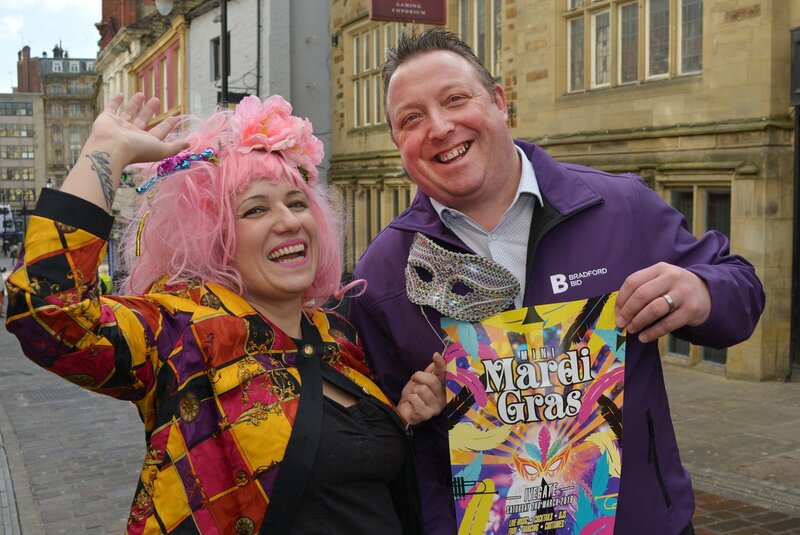 The BID is supporting a Mini-Mardi Gras in Ivegate to help attract visitors to the street, which is starting to undergo a revival. The event, which takes place on Saturday, March 2, is a New Orleans style jazz/ska/Cajun/blues mini-festival involving some of the street’s newest and liveliest venues. BID manager Jonny Noble said: “Ivegate is enjoying something of a renaissance, with a number of new venues and shops, and we want to help it to keep on developing and growing. “Our Alive strategy is about breathing fresh life into every part of the city centre and we hope that by helping businesses in specific areas, which often have their own distinct character, we will encourage them to work together for the benefit of all. The Mini Mardi-Gras is being co-ordinated by The Brick Box Rooms, which is run by the creative live arts and community interest organisation of the same name that has staged festivals and events across the country. Venues taking part so far include Sunbridge Wells; The Old Crown, which is staging a “Skadi Gras” of live ska/reggae bands from 3-6pm and 9-11pm; and Bar 39, which is laying on a special Mardi Gras DJ. The Brick Box Rooms will be serving unique “hurricane cocktails” and a menu of Cajun-style food, such as jambalaya and gumbo, and live music, including a jazz piano. Brick Box co-director Rosie Freeman said: “We’re delighted to have the support of the newly-formed BID on this multi-business Ivegate event. “Mardi Gras is celebrated around the world, and it allows people to subvert social norms, dress up, and get together as a community. It’s also a great time of year to blow away the winter blues with a proper party. “There’ll be delicious cocktails and food, live music and DJs, the chance to make your own costume and generally get in the swing of things. Mardi Gras, or Fat Tuesday, is celebrated in many different countries, each with their own traditions such as Shrove Tuesday in the UK. The following day, Ash Wednesday is the start of Lent, with six weeks of ritual fasting and religious observance. The word “carnival” is derived from carne vale, “farewell to meat.” Faced with 40 days of penitence and abstinence, many countries use Mardi Gras as an excuse for a no-holds-barred party.